Console is essentially the hardware's logging system, and that is what we want to look at as it will show what is being called at the time of the crash. If it is not already launched you will need on your Mac to got to the applications folder, and then select utilities and in here is a utility called Console. If you launch it, it will show you that it is logging what is happening on your machine. The file can get very large, so if you sweep it (little broom icon) it will clear it, and then attempt the conversion, after the failure if you could then copy the text in the Console and forward to us. Do you mean the report that it asks me to run when it crashes? Can you please forward a copy of the Macs console when the failure occurs. Hi James. Still doing the same thing. 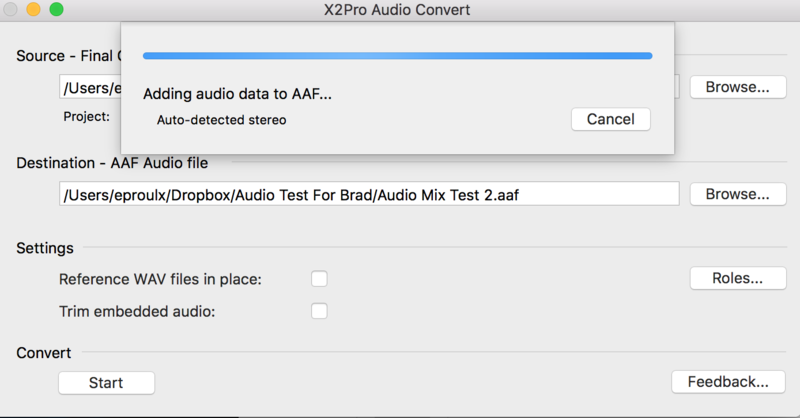 It crashes during the "addiing audio data to aaf" phase. See attached screen shots. Last Edit: 2 years 6 months ago by eproulx. The XML goes through here without issue, so would you be able to clear the console, and initiate the transfer again and then forward a copy of the console please. Well, I tried replacing all the top-layer media with one exported quicktime (instead of the offending Canon files) to see if that would resolve it. Now X2Pro just crashesevery time I try to create an AIF file. (I even updgraded to the non-LE version to see if that would help). New XML and screen shot attached. Can you please help? 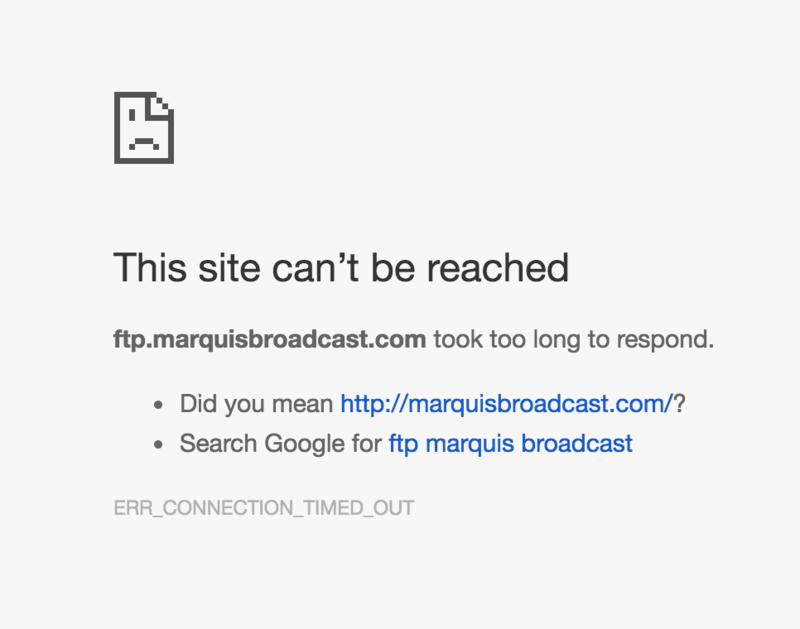 The FTP site you sent me wasn't loading. But I replied to your email with a dropbox link that contained that clip. 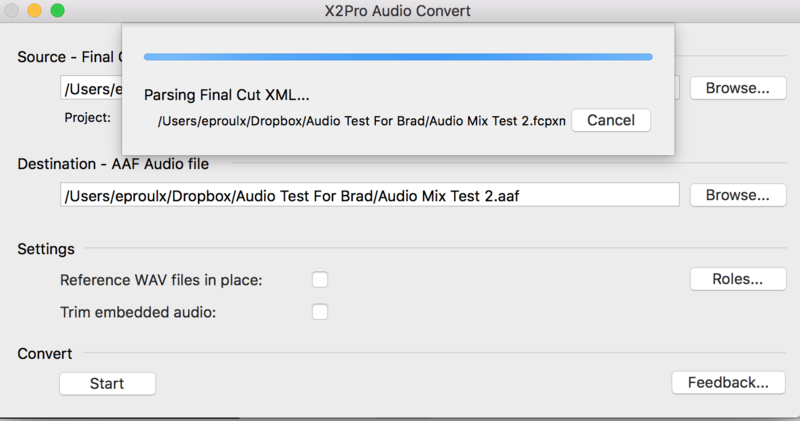 The XML itself is ok, will pop you a mail as we would like to look at the clip in question that is causing the failure "/G-DRIVE%20PRO%20Thunderbolt/Chamber%20of%20Commerce/C300/CONTENTS/CLIPS001/A005C278_150225U7_CANON.MXF". Otherwise the workaround as mentioned by CountryMatters may help you. In my case, the only thing that worked was to delete each problematic clip one by one, re-export XML and try again until it generated an AAF file properly. Very time consuming and of course you have to be really careful to make sure nothing shifts on the timeline when deleting/replacing clips. Curiously in my case, the clips that caused the problems were all Sony codecs (XDCAMHD) so perhaps there's something weird going on with Long GOP?? I don't know if this helps you but when/if you do find and fix the problem, please post the solution you've found. Hello. I am also getting this error ("invalid track layout"). So I upgraded to OSX 10.12 and, alas, I am still getting it. I could sure use some help but not sure where to start. Any advice? I've attached the XML in question as well as the error message. FYI, even when I delete the specific file in question and create another XML, it gives me the same error with another clip. After investigating and much discussion internally; we are not able to pinpoint an exact change or patch in the new version of OS that resolves the error you are getting on your systems with this XML and the previous version of OS X. It is our conclusion that the best, and seemingly only, option for your project to be converted is to upgrade your system OS to the latest version. I know you were looking for a resolution outside of upgrading your Os, but there just does not seem to be one. Many thanks for your help and patience with us. Last Edit: 2 years 9 months ago by Jeremy Norwood. okay - email with link to download file sent. I am not able to reproduce things in the lab here with the FCPXML alone. 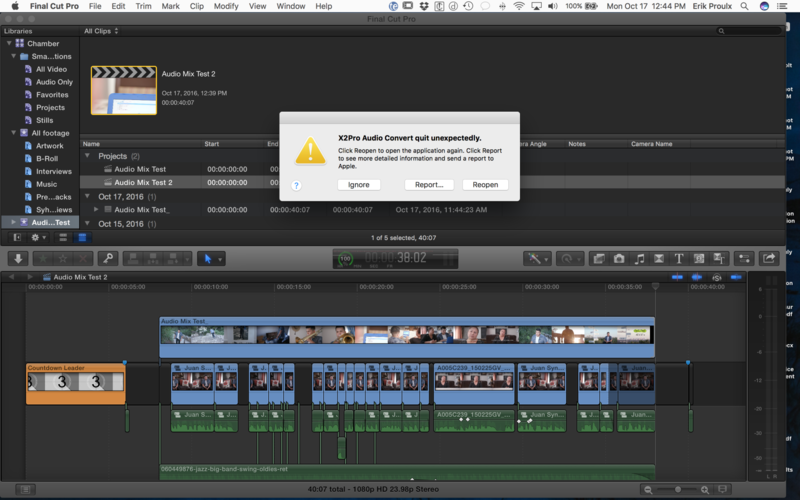 Would you be able to provide one or two of these MXF files that are giving this error? Possibly file "C003C030_1604097I.mxf" or "C004C010_160409W4.mxf"
Try compressing it first and then uploading.